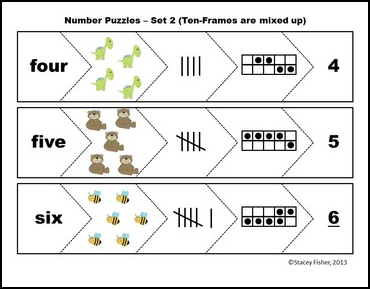 This freebie contains puzzles for the numbers 1-9. Students match number words, pictures, ten-frames, tally marks, and numerals. Just print, laminate, and cut the puzzle pieces apart. There are two sets of the same puzzles included in this freebie. You can choose to print the puzzles with dots on the ten-frames presented in the "traditional" format where the dots progressively fill up the top row, from left to right, before filling up the bottom row. The second set of puzzles is almost exactly the same. However, the dots are randomly placed on the ten-frames in the second set of puzzles. Choose what would work best for your kids. If you liked this product, check out my ten-frame unit. 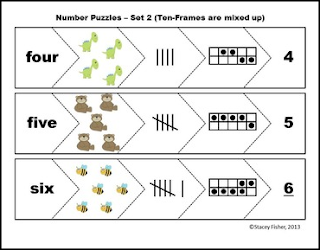 The 82 page packet contains LOTS of differentiated activities with ten-frames.